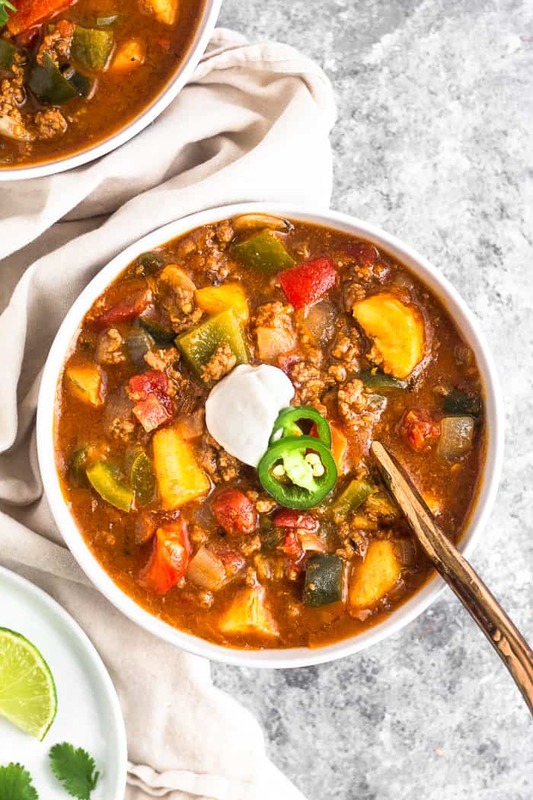 An easy one pot meal ready in 25 minutes, this Paleo Beef and Plantain Chili is sweet and spicy making the perfect healthy comforting meal. 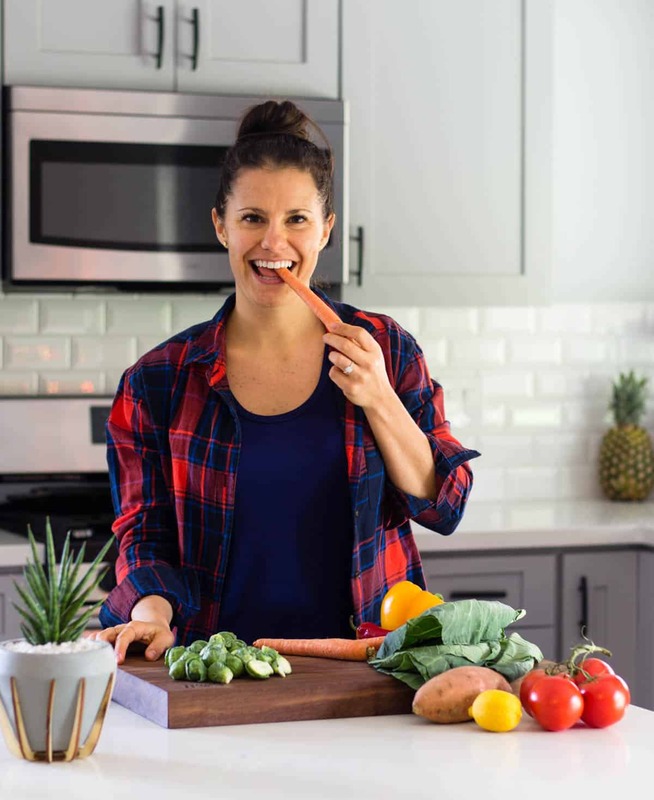 This recipe first appeared on an email campaign in partnership with Artisan Tropic. Chili!! 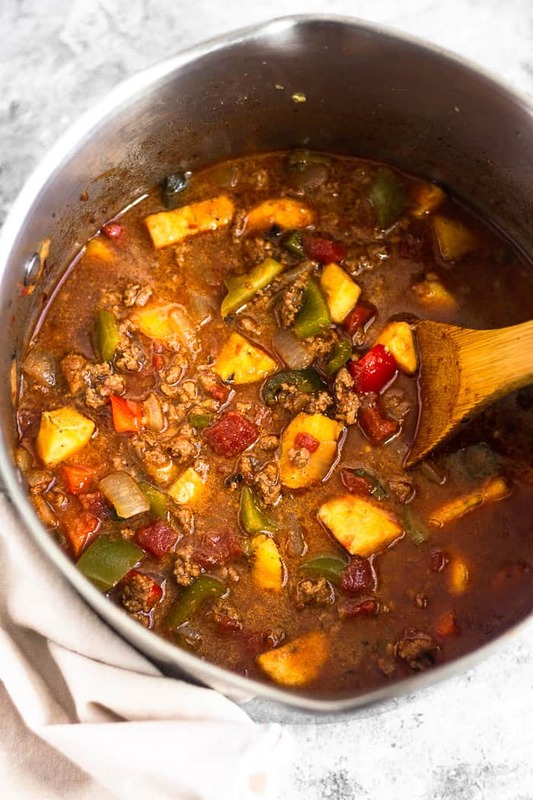 This is my first chili recipe on the blog!! How crazy is that?! And I love chili. But after almost 4 years, somehow it didn’t make an appearance. Probably because I usually just throw thing in the pan without measuring when making chili. 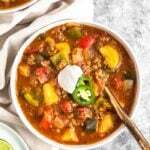 Well things are changing and I actually measured and am sharing this fun spin on your classic chili – a paleo beef and plantain chili! My love for plantains runs deep. Whether they are in chip form, added to egg cups, or using them as a crust to make crispy shrimp tacos, I can’t get enough. They make the perfect sweet accompaniment to a usual savory meal. And sweet and savory is my jam. 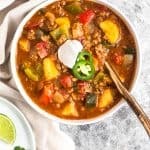 To take this chili up a notch, I decided to swap out the usual potatoes and add plantains instead. 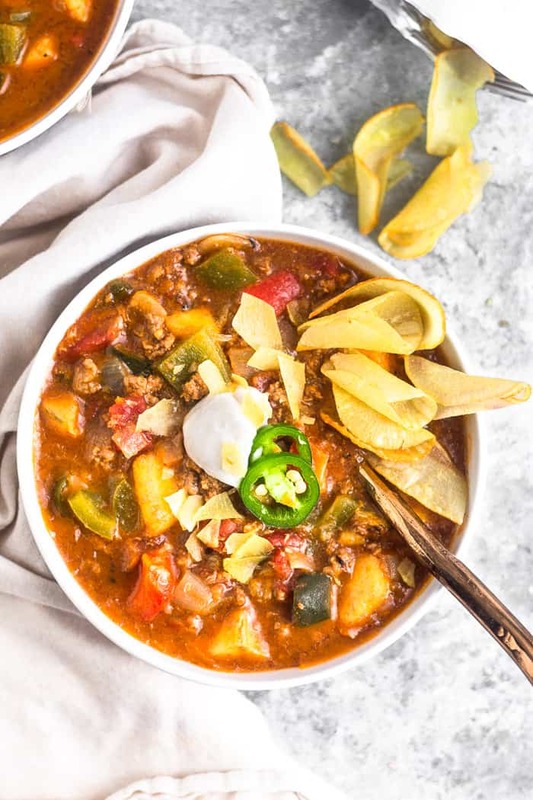 The verdict – a flavor packed savory chili with the touch of sweetness from the plantains and a kick of spice from some peppers. 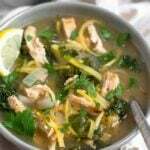 It make a perfect warm and comforting meal on a chilly night (although I think the polar vortex is over?) 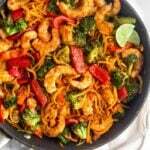 or meal prep dish for the week! 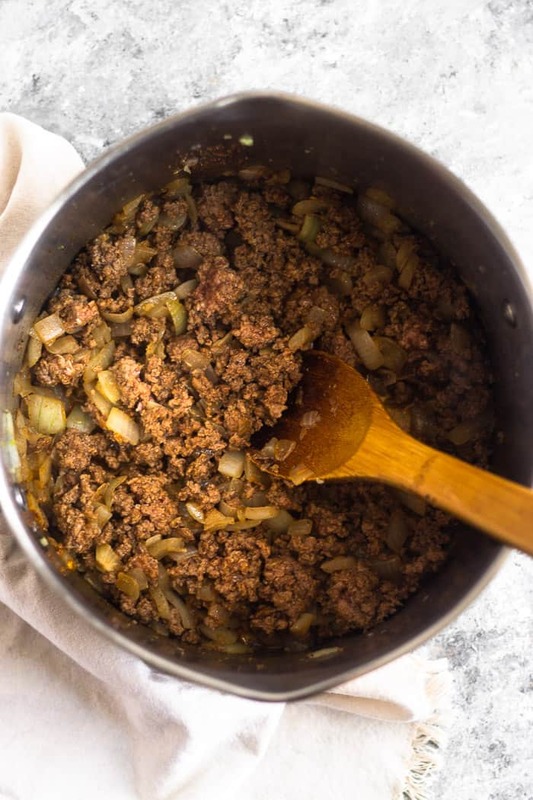 To make beef and plantain chili, you first start by sautéing the onion and garlic until soft. Then you add the beef and taco seasoning and sauté until it is browned. Next it’s as easy and adding the peppers, broth, and some spices and bringing that to a simmer. Finally you add the plantains and cook for another 5-7 minutes until they reach your desired consistency. Top it off with some lime juice and all the toppings and enjoy! 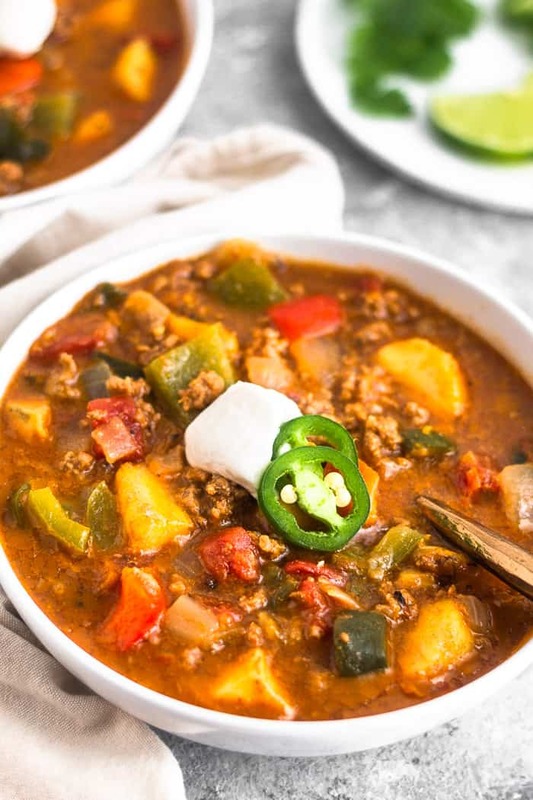 One of the best parts about chili is the toppings! You have this warm bowl of soup and you get to top it with something crunchy, creamy, cool, and more. Some of my absolute favorite toppings are avocado, coconut or Greek yogurt (so good to mix it up in there), sliced jalapeño, cilantro, lime juice, and chips!! You really can’t pass on the chips. They have the perfect crunch on top and they double as scoop! 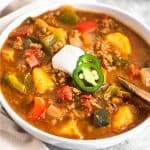 Can I make this in my slow cooker or Instant Pot? 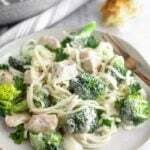 I have not tried either version as the stovetop method is pretty quick. 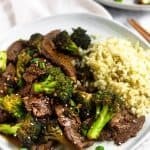 If you wanted to make it in your crockpot or Instant Pot, you would need to brown the beef before adding all the ingredients. For the slow cooker you would have to do this on the stove. For the Instant Pot, you could do this in the actual Instant Pot pan on sauté mode. After that you would just dump in the reminding ingredients. The crockpot you could do on low for 6-8 hours and the Instant Pot on manual for 10 minutes (would be my best guess). My only concern is that the plantains would get too mushy and lose their texture. If trying this method, I would go for green-yellow plantains. If you do try it, leave a comment and let me know if it works! 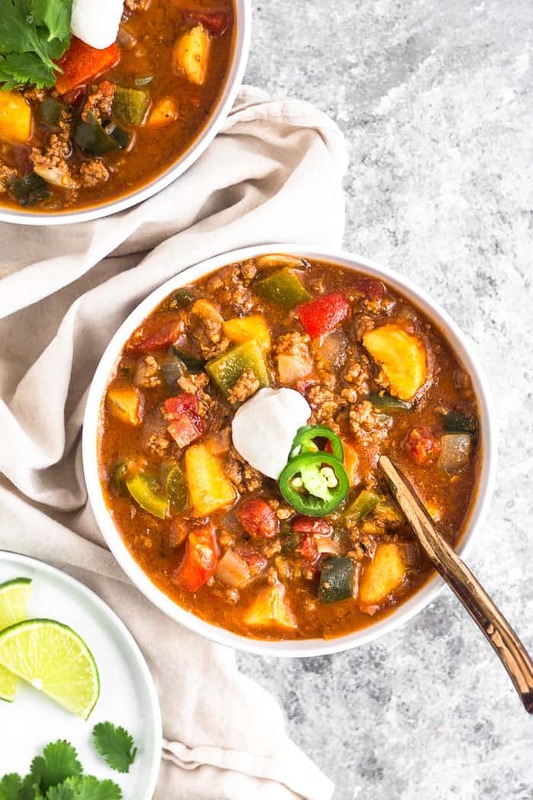 An easy one pot meal ready in 25 minutes, this Paleo Beef and Plantain Chili is sweet and spicy and the perfect healthy comforting meal. In a large stock over medium heat, add avocado oil and let it get hot, about 30 seconds. Add onion and garlic and sauté for 5 minutes, stirring frequently. Add beef and taco seasoning and sauté for another 5 minutes until browned on the outside. Add peppers, jalapeño, broth, tomatoes, chili powder, cinnamon, red pepper flakes, and salt and pepper and let simmer for 3-5 minutes. Add plantains and cook for another 5-7 minutes until soft, but not mushy. * Turn off heat and stir in lime juice. Serve with chips, coconut yogurt, cilantro, jalapeño, and whatever else you like! *time of peppers and plantains depends on how you like your chili. I like a little crunch to my veggies so I did about 3 minutes for the peppers and about 5 minutes for the plantains. It also depends on how ripe your plantains are. If your plantains are very yellow, they will take longer to cook. If they have a lot of brown spots, they won't take as long. Watch them carefully so they don't get mushy. I loved this chili!!!! I am a lover of plantains, so when i saw this recipe go up I knew I had to try it! It is packed with flavor and W30 compliant which I love. Plantains are the best! So glad you liked it Rachel and thanks for trying it!! I made this last night and it tastes even better today!! Just the right amount of spice and sweetness and very easy to prepare. Definitely recommend!! Yes! Leftover chili is the best! So glad you liked it, thanks Sarah!